Not too long ago, we went hands-on with the Samsung Galaxy S III. In fact, XDA Elite Recognized Developer Chainfire, who was later kind enough to go on camera for a fun interview and unboxing, even made a brief cameo in the video as we tested USB Host functionality on the SGS3 using his popular DSLR Controller app. Needless to say, much of the Android community is eagerly anticipating the launch of Samsung’s new flagship. Unfortunately, I am not able to share the “insecure” kernel with you at the moment, because of fears it is traceable to the leaker (this is said to be the last traceable firmware revision). This root is, as expected, trivial. It was a simple matter of repacking the stock kernel, with a modified adbd binary that thinks ro.secure=0 (even if ro.secure=1). 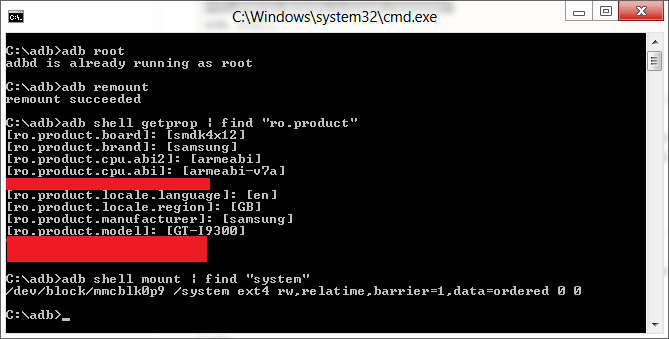 This gives access to all adb root commands (see screenshots). Then SuperSU was installed manually. Kernel – The modification was trivial, because this time around, Samsung is using the standard boot.img format, instead of the zImage format used for SGS1, SGS2, SGNote, etc, that is much harder to repackage. Recovery – The recovery partition is also being used this time around. And thus we can flash recoveries separately from the kernel. Bootloaders – There was no warning triangle at boot-up after flashing the modified kernel, but download mode did show a custom kernel flash counter which increased. Whether or not flashing a custom recovery also triggers this counter is as of yet unknown. Also, Triangle Away did not work. They have hidden the boot partitions again as on the latest SGNote firmwares. Now if you take a closer look at that last line, you’ll see what is perhaps the most impressive aspect of Chainfire’s achievement. Not only is he the first to root the device, but he did so working remotely, sight-unseen. What are you waiting for? If you’re lucky enough to have your hands on a pre-release SGS3, head over to the original thread to learn more. This is exciting news even if you don’t yet own the device, but wish to purchase one in the near future!